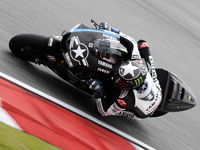 MotoGP 2012 finally got underway today with the first of three days of testing at the Sepang circuit in Malaysia. Yamaha Factory riders Jorge Lorenzo and Ben Spies took their first ride on the 1000cc YZR-M1 since last year. Both riders blew the cobwebs off quickly and settled down to an impressive pace, Lorenzo proving to be the fastest man on track with his teammate always close behind him. The focus for the first day was to get back into the swing of riding and also to establish a good base setup. Tomorrow and the day after, Lorenzo and Spies will compare various new settings to provide valuable data for the second Sepang test in one month's time. Yamaha Factory riders Jorge Lorenzo and Ben Spies continued to show promising form today in the second day of testing at Sepang, the first official 1000cc MotoGP test of 2012. Having spent yesterday getting back into the rhythm of riding, today was spent focusing on comparative testing in a number of areas. The team worked to gather data to optimise the balance of the 2012 YZR-M1 chassis whilst also working to refine the power delivery from the increased engine capacity. Spies led the field for the majority of the day with teammate Lorenzo just behind, but the Texan was eventually knocked from the top spot by just 0.157 seconds by Casey Stoner. Tomorrow's final day of testing will see a further shakedown by the Yamaha riders before they return in one month's time for the second test of the season. 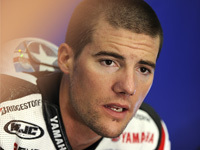 The Yamaha Factory Racing Team completed the first test of the 2012 season at the Sepang International Circuit in Malaysia today. 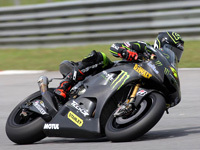 Riders Jorge Lorenzo and Ben Spies spent the three track days working to develop the base setup of the 1000cc YZR-M1 ahead of the second Sepang test in one month's time. The riders and engineers focused on the balance of the M1 chassis along with improving the electronics package to gain optimum performance from the increased horsepower. The new Bridgestone tyres were also assessed ahead of the upcoming race season. 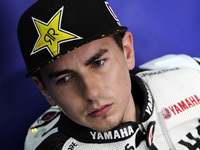 The times from today's final session saw Lorenzo slot in as the second fastest rider, 0.59 seconds behind Casey Stoner. Teammate Spies wrapped up in fourth position, 0.88 seconds from first. The riders will now return to the USA and Spain respectively whilst the engineers return to Japan with the valuable data to make the next steps forward in development. The team will return in four weeks time to test the work done. "I'm really, really satisfied, I have improved on my best record here in Sepang. We tried a lot of things; some have been a lot better, especially one major improvement. We also know where we have to improve in the future. The electronics are not perfect yet, we still need to make it smoother but the bike has so much potential and we are very optimistic. The Yamaha engineers have worked really hard so they have done a good job. I made my best time today at midday which is the hardest time with the conditions so it was pretty good. Let's see what we can do when we come back." "It's been a good test, we got a lot of things accomplished and we're definitely moving in the right direction with my bike. I tried the Yamaha test rider's bike today which had a slightly different set up to make a fair comparison with mine. I made a small mistake, losing the front but that's testing; it can happen when you're working out the good and bad! All in all it's been great and I'm really happy and looking forward to coming back and seeing what's new." "I am really pleased with the way things have gone at this test and it has been a really good confidence booster to start 2012. Sepang is a track I just don't get on with or enjoy riding at but I was third on the first day and fifth on the second day. I'm sure I could have been fifth on the final day too but a couple of things didn't go my way. I had a crash early on at Turn 13 when I basically ran wide and got on the dirty part of the track. It was my fault and that cost me a fair bit of track time and when I was confident I could go a lot quicker at the end - it started raining. The pleasing aspect is my times have been consistent and that bodes well for the future. I'm not as fast as Stoner, Spies, Pedrosa or Lorenzo but for consistency I'm the best of the rest. The new 1000cc YZR-M1 has kept the strong points of the 800 with good corner entry and turning. But we do need to look at improving the bike on corner exit. Being in the top five on the first two days and not far away on the final day is a great start but I'm not going to get carried away. This is only the first test and while testing is really important, it is what happens in Qatar on April 8 that is really important." "I am really happy just to have been able to come to this test and ride because beforehand a lot of people said it would be impossible. My collarbone was very badly broken but this test is very important and I want to thank everybody that helped me in my recuperation in Italy that made it possible for me to ride. You can do a lot of good work here even if it is very bad for my body, but I am happy because I could ride on each day and my feeling with the Yamaha is much better than the first time I tried the bike in Valencia. I understood much more about this bike here and what I realise is that I have to change my style more. There is a big difference in the characteristics of the Yamaha and the Honda I rode for the last four years, so I have to learn to use the good points of the M1 more. But it was not so easy riding in my physical condition. Braking for the right-hand corners was hard but changing direction was an issue as well because I don't have 100% of my strength. I am looking forward to the next test where I will be a lot closer to being 100% fit."